July 19, 2018, 7:30 a.m. to 9:00 a.m.
Brown repeats this phrase repeatedly, "the darkest places in hell are reserved for those who maintain their neutrality in times of moral crisis". Brown attributes the quote to the 14th century Italian poet Dante Alighieri, The historian Michael Haag says "Dante never said any such thing. Brown's alleged quote, Haag says, is derived from a remark by President John F. Kennedy: "Dante once said that the hottest places in hell are reserved for those who in a period of moral crisis maintain their neutrality," Haag further claims that Kennedy either made up the quote or misquoted the Dante's Canto III. In either case, prior to NATO'S involvement with curtailing Serbian aggression followed by the brokered Dayton Accords in 1995, Power's claims "the United States had never in its history intervened to stop genocide and had in fact rarely even made a point of condemning it as it occurred." So the question is, should the United States, or any country, intervene in the blocking of genocide? Power's quotes Abraham Lincoln, "We---even we here---hold the power, and bear the responsibility." Perhaps Lincoln was not talking about genocide, but he was talking about taking responsibility during moral crisis. 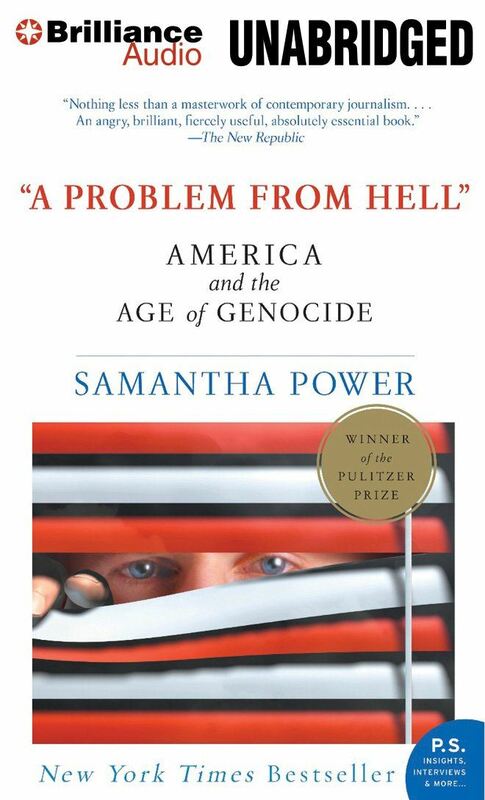 After two years of covering the wars between the Serbs, Croats and Muslims, Power's began in depth research on the international response to genocide. Chapters one through five tell the desperate struggle of Raphael Lemkin who coined the term genocide and fought throughout his life to force nations to establish laws against genocide and create tribunals to try war criminals. The remaining chapters describe genocide in Cambodia, Iraq, Bosnia, Rwanda, Srebrenica and Kosovo with a conclusion based on her research. The book was published in 2002 so I will have to add a supplement to bring history up to date. In 1928 Frank Kellogg of the United States and Aristide Briand of France signed a Peace Pact outlawing war. The story is told in the most recent book The Internationalists by Hathaway and Shapiro. Genocide is not mentioned in the Pact, however neither the ending of war nor the ending of genocide has occurred in the years that followed. Genocide is the end result of mankind dehumanizing mankind. "Believe me," said Horton. "I tell you sincerely, my ears are quite keen and I heard them quite clearly. I know there's a person down there. And, what's more, quite likely there's two. Even three. Even four. Quite likely a family for all that we know! A family with children just starting to grow. So please, “Horton said, "as a favor to me, try not to disturb them. Just please let them be". Please join us to discuss war crimes and international tribunals at the next book session.